End-use situations must be taken into account in estimating the life expectancy of any building material. However; when properly installed per the Air Duct Council (ADC) installation instructions, furnished by most manufacturers with the shipping carton, Flexible Air Ducts should last for the life of the dwelling. What is the difference between Flexible Air Ducts and Flexible Air Connectors? UL (Underwriters Laboratories) in their UL 181 Standard for Factory-Made Air Ducts and Air Connectors, defines two categories of flexible "ducts"
The UL Listed Flexible Air Duct must pass all of 15 tests in the UL 181 Standard. Air Ducts are labeled with a square or rectangular label showing their respective listing. There is no limitation on the length of runs when using UL Listed Air Ducts. The UL Listed Flexible Air Connector must pass only 12 of the 15 tests of the UL 181 tests, and is labeled with a round shaped label, which states "for installation lengths not over 14 feet". An installer may not increase the 14-foot limitation by using a splice between 14' sections of Air Connectors. This length limitation is set by the requirements in NFPA 90A & 90B Standards. What about the thickness of insulation? Insulated Flexible Air Duct is commonly manufactured with these three R-Values: (4.2, 6.0 and 8.0). Above 8.0 is generally considered a special order. In an attempt to standardize, the flexible duct industry no longer states insulation values in thickness and density. Today, per the requirements of national energy codes, manufacturers report R-Values based on the insulation k-value only, at installed wall thickness, when tested per ASTM C-518. What do you mean by a "certified R-Value"? In the early days of insulated flexible duct, each manufacturer published their individual thermal values (R-Value) using various methods and test standards which caused confusion in the marketplace. Over time engineers, contractors and code officials required a standardized method to correctly determine & compare flex duct thermal values. 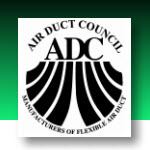 The Air Duct Council (ADC), the association of North American flexible duct manufacturers, determined early in its formation that flex duct R-Values needed to be consistent throughout the industry. ADC, with the assistance of UL and ETL, created the ADC Thermal Performance Program for R-Value ratings in 1993 (25 years ago). This program includes testing of thermal values at the insulation manufacturer and testing and follow-up verification of product parameters at the flex duct manufacturer to classify the resulting flex duct R-Values. This method of testing, classifying, and follow-up testing was designed to keep the industry "honest & standardized" when publishing flex duct R-Values. The ADC test method determines R-Values based solely on the thermal performance characteristics of the insulation in the thickness it is installed. Inner core films and vapor barrier properties are not used. Most building codes today recognize & enforce the need for a standard method of determining duct R-Values. Many mechanical codes include language requiring duct R-Values based on the insulation only. ADC members adhering to this method can "certify" their products for R-Value performance and label with the ADC Thermal Performance Seal of Certification. So, how do you know if a flex duct meets the R-Value required by building codes, engineers, and contractors? The answer is simple. Look for the ADC Thermal Performance "Seal of Certification" prominently displayed on the vapor-barrier of your insulated flex duct. Can Flexible Air Ducts or Flexible Air Connectors be used to vent clothes dryers? No. UL Listed Class 1 Air Ducts and Class 1 Air Connectors are intended for use in heating and cooling system designed for comfort air movement. Exhaust ducts for domestic and commercial clothes dryers must be constructed of metal and have a smooth interior finish. Flexible ducts that are acceptable for use to connect from the clothes dryers to the exhaust duct are covered under a different listing category than normal HVAC air ducts and air connectors and they must be tested, listed, and labeled as a "Clothes Dryer Transition Duct". These transition ducts are limited to 8’ maximum installed length and cannot be concealed within construction materials. Many ADC members do manufacture Clothes Dryer Transition Ducts in addition to the more common Class 1 Air Ducts and Air Connectors. If you are using a flexible duct to transition from the clothes dryer to the exhaust duct, make sure the transition duct is listed and labeled as a "Clothes Dryer Transition Duct". In addition, follow both the duct and the equipment manufacturer’s instructions for installation. Can Flexible Air Ducts or Flexible Air Connectors be used for bathroom/shower exhaust fans? Class 1 Air Ducts and Class 1 Air Connectors may be used in most cases to connect to bathroom/shower exhaust fans. Always check local code limitations and the fan manufacturer’s installation instructions and limitations first. An insulated air duct on longer runs can assist in keeping the moisture from condensing inside the duct and help prevent "pooling" of water in low spots which could damage the duct. Can insulated Flexible Air Duct be exposed to ultraviolet (UV) sunlight? Some polymeric materials used to manufacture nonmetallic flexible ducts will degrade with prolonged exposure to ultraviolet (UV) radiation. This UV radiation occurs naturally in sunlight or it can be artificially generated using specialized lamps. The outer barrier (jacket) may degrade if ducts are installed outside in direct sunlight or within attics, crawl spaces, etc. where direct sunlight enters, e.g. turbine vents, sky lights, canopy windows, etc. The inner core (liner) may degrade if ducts are positioned near a bio-treatment lamp (UV emitter) installed within the HVAC system. Unless the product is specifically designed to withstand the exposure to UV light, care should be taken to ensure the outer vapor barrier and inner core material are shielded from direct sunlight and UV radiation. Reference the manufacturer’s recommendations for specific product information related to UV exposure. Are Flexible Air Ducts and Flexible Air Connectors tested for mold growth and humidity? Flexible Air Ducts and Air Connectors that are listed and labeled in accordance with the UL181 Standard have been tested for mold growth and humidity. The purpose of this test is to determine if the components used in the manufacture of the duct will contribute to the growth of mold and mildew. Refer to Section 3 (Testing, Listing, Reporting and Certifying) of the ADC Flexible Duct Performance & Installation Standards (The Greenbook) for further information on the test program for listing flexible ducts. A copy of this Standard can be ordered and downloaded at www.flexibleduct.org. Can I use the same size Flexible Air Duct as I would use for round sheet metal? The pressure drop in a flexible duct is usually higher than that of smooth sheet metal pipe. This is due to the convolutions created by the wire helix in flexible duct. Thus, as a normal "rule of thumb", when comparing a straight length of round sheet metal pipe to the same straight length of flexible duct, and due to rounding up to the nearest available dimension, the flexible duct should generally be 1" larger in diameter. However, since flexible ducts are usually over-sized in diameter as compared to round sheet metal and since the routing of a flexible duct can allow for gradual bends versus abrupt elbows, it is feasible that the same diameter flex can be used when compared to a given length round sheet metal duct run. Both sheet metal ducting and flexible ducts should be sized using the appropriate pressure drop data provided by the manufacturer or published in referenced literature printed by credible organizations such as ADC, ACCA, and ASHRAE. Duct sizing should be done in accordance with applicable procedures in ACCA Manual D.
Can screws be used to fasten Flexible Air Duct core? ADC does not recommend the use of metal screws for making connections and splices with non-metallic flexible air ducts. Procedures and materials (tapes, mastic, fasteners) for connecting and splicing non-metallic flexible ducts are evaluated using UL181B Standard which does not address the use of metal screws. Potentially, metal screws can damage the components in some non-metallic flexible ducts. ADC does recommend the use of sheet metal screws for making connections and splices with Metallic flexible air ducts. What materials are used to hang or support Flexible Air Duct and Flexible Air Connectors? There are a number of different materials, which are used regionally. ADC does not specify a particular material in our installation instructions. However, ADC does make the following statement: "Hanger or saddle material in contact with Flexible Air Ducts and/or Flexible Air Connectors shall be of sufficient width to prevent any restriction of the internal diameter of the duct when the weight of the supported section rests on the hanger or saddle material. In no case will the material contacting the duct or connector be less than 1-1/2" wide". As in all cases, local jurisdiction has the final say in these matters. Must UL-listed Duct Tape, Mastics, and Clamps be used? The national codes require that tape, mastic, and non-metallic mechanical fasteners (plastic ties) used for sealing flexible ducts be listed and labeled to UL181B Standard. f Metallic clamps are not required to be listed. Tapes shall be listed and marked "UL181B-FX". Mastic shall be listed and marked "UL181B-M". Non-mechanical fasteners shall be listed and marked "UL181B-C". What is ADC's position on cleaning flexible duct? The "cleaning" of air ducts, including flexible duct has become a common practice. For the purpose of this narrative, ADC will address only the removal of dust and debris from the inside surface of a flexible duct since "cleaning" can infer additional aspects. Whenever dust & debris removal is considered the owner should consider flexible duct replacement especially if the air distribution system is 15+ years old. The opportunity to replace a duct system using new ducts that meet or exceed current R-Value insulation requirements and much tighter installation methods would not only provide clean ducts but also provide lower energy costs to operate the system. If "cleaning" is preferred, ADC recommends that dust & debris be removed from inside flexible ducts by qualified technicians following the procedures outlined by the National Air Duct Cleaners Association (NADCA) or another nationally recognized duct cleaning organization. ADC has investigated the removal of dust and debris from the inside of flexible ducts using the rotating brush and vacuum process per NADCA procedures. The brush and vacuum processes did not exhibit any visible damage to the inner liner of the flexible ducts during the "cleaning" process. ADC does caution that flexible duct inner liners may be damaged by overly aggressive contaminant removal techniques, such as high-pressure blow guns, air skipper, and air whips. When the process is completed, any flexible duct connections that were opened to clean the duct must be properly resealed in order to maintain air tightness and duct thermal properties.